The Mark V 39 is relatively easy to build outboard powered sharpie. Cruising speed is 7 to 10 knots with a 25 to 50 hp outboard. . Construction is mainly plywood and epoxy. The bottom is 2” thick, and the sides are 1” thick, making the hull stiff enough to eliminate a lot of framing and bulkheads. Lofting is not necessary, as all the dimensions for the molds and bulkheads are on the plans.There is 6’8” headroom throughout the interior. The aft cabin has a settee that folds out into a queen sized bed, a desk, and hanging locker. Forward is a galley, helm, and folding table. There is also room forward for a queen-sized air mattress. There are plenty of opening windows for ventilation. 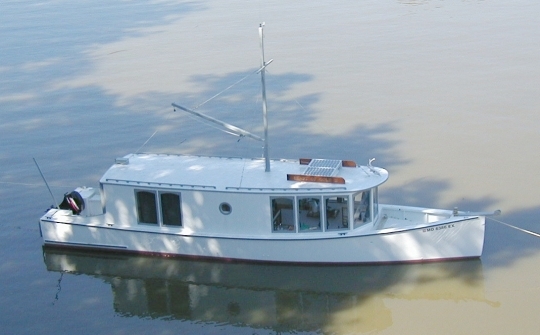 There is a self bailing cockpit aft, with two 24 gallon gas tanks, and a sunken foredeck with lots of stowage under. 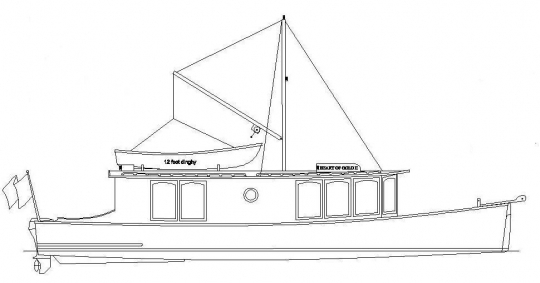 See WoodenBoat # 167 for a design review. Metric plans are also available.